Quit Smoking Now – Neighborhood Health Clinic, Inc.
“Quitting smoking is the single most important thing that our patients can do to improve the health of themselves and their families”, said Dr. Robert Morantz, past Board Member. The Neighborhood Health Clinic is proud to host the Everglades Health Education Center’s Quit Smoking Now program. This program is FREE of charge and open to ALL members of the community. All patients of the Neighborhood Health Clinic who smoke are required to attend the class. 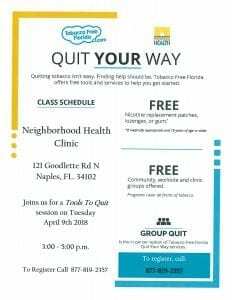 For more information on how to participate in the next QSN class hosted at the Neighborhood Health Clinic, please call the Clinic at 239.529.2255. Click here for a full schedule of sessions offered by the Everglades Area Health Education Center.